Another way to enjoy unlimited call and text is not just with Sun friends. Sun Cellular offering you this new promo also to keep in touch with your friends in other network. This is just simple. Just follow the guides below and you will surely avail the promo that you want. 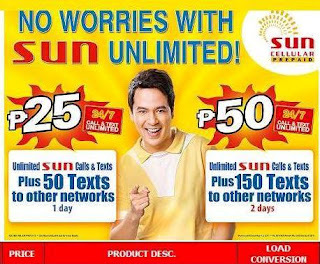 Sun Cellular offers you different choices for you to choose what promo will be relevant for your need this day. You can now keep in touch with your friends, 24-hours a day, 7-days a week by calling and texting them whenever you want.